New York State Environmental Conservation Officer Spencer Noyes can spot a tractor that’s not up to environmental standards by the color of its exhaust. He can recognize an inexperienced fisherman by the gleam of his gear. He’s tracked down albino pythons and every possible manifestation of alligator skin, including the skin still attached to a breathing animal. The python case is ongoing, but he’s happy to supply more details on the live alligator seizure. Noyes had found the juvenile alligator for sale on Craigslist, so he went undercover as a potential buyer. He arranged to meet the seller near the Western Beef meat department in the Chelsea neighborhood of Manhattan. Two other officers were a block away, waiting for him to make the deal. Once the Craigslist seller revealed the baby alligator, Noyes identified himself as an environmental conservation officer. “They were speechless,” says Noyes. “They couldn’t believe it.” The seller accepted the $250 fine without complaint. The alligator was taken from its shoebox to a new home upstate, where it is now part of a nature education program for children. The New York City region has the highest turnover rate of environmental conservation officers in the state. Lopez attributes this to the added complications of working in the city, as well as the high living expenses. Environmental conservation officers have a starting salary of $53,304. “Most people are not doing it for the money, they are doing it for the love of the labor,” says Lopez. Noyes is one of the officers who does this work because he loves it. After college at State University of New York at Potsdam, where he studied forestry, he worked as a hockey coach at Morrisville State College. But that was just a temporary gig. He knew from the age of 16 that he wanted to be an environmental conservation officer, ever since he made pleasant conversation with one while fishing in upstate New York. Along with a couple thousand other aspiring officers, Noyes took the civil service test in 2012. Only 15 to 30 of them qualify. Noyes’ score wasn’t high enough the first time, but after his second try he was added to the wait list. On the first Friday of the paramilitary academy that all potential conservation officers must attend, he was told to suit up. He was in. Noyes’ training reflects Roosevelt’s values. The students rose at 4 a.m. for fitness training. To qualify for the program, they had to be able to do 33 pushups in a minute, as well 40 sit-ups with no time limit. They also had to run a mile and a half in less than 12 minutes. And by the end of the training, they had to cut their times even further. Between workouts, the students took classes on the state’s criminal, penal and conservation laws. Exams followed each course; if they didn’t pass, they were booted from the program. Noyes was assigned office duty on his first day of work. He filled out paperwork and answered phone calls about hunting and fishing regulations. On his second day, Noyes finally got out into the field, more than ten years since he first decided to become an environmental conservation officer. He was on fishing enforcement duty in upstate New York. He watched fishermen to make sure they were catching the right species and number of fish for the season. He says he doesn’t always give violators a ticket. He speaks with them and looks for suspicious behavior, like hiding illegal fish in plastic bags or tying them to a stick and concealing them under the water. He wants to give people who are new to the sport a chance to make mistakes. “If it’s a new fisherman, you don’t want to give them a bad taste in their mouth,” he says. Though Noyes is a full officer now, he still takes time to train. Last month, he went to advanced environmental forensics training. He practiced putting on non-porous gloves, a chemical respirator and a full protective suit so that he can enter crime scenes that contain hazardous waste, such as infectious blood or animal carcasses. Noyes does all this training to prepare for the most unpredictable species out there — Homo sapiens. 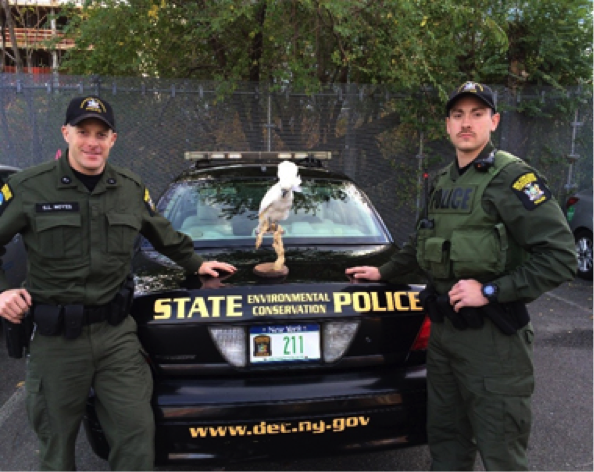 As a conservation officer in New York City, he must consider public perceptions. “NYC is the most complex office to run,” says Captain Lopez. “We have to be politically sensitive.” For example, environmental conservation officers can legally shoot and trap deer on Staten Island. However, they try not to unless the animal is a danger to people. “If our officer were to shoot a deer for whatever reason, that’s bad publicity,” says Lopez. Instead, the state has a program to neuter male deer to thin the breeding population. But there are still enough lawbreakers to give Noyes and his colleagues plenty to do. In 2015, the nearly 300 environmental conservation officers issued over 22,000 tickets for deer poaching, toxic dumping, illegal pet trade and excessive car emissions. “They work long and arduous hours, both deep in our remote wildernesses and the tight confines of our urban landscapes,” said State Environmental Conservation Commissioner Basil Seggos in a statement. A new class of about 30 new officers will graduate from the Pulaski training academy this August.